The latter won out and I grabbed a K.A. Kendall’s 7-20-4 Robusto from my humidor. 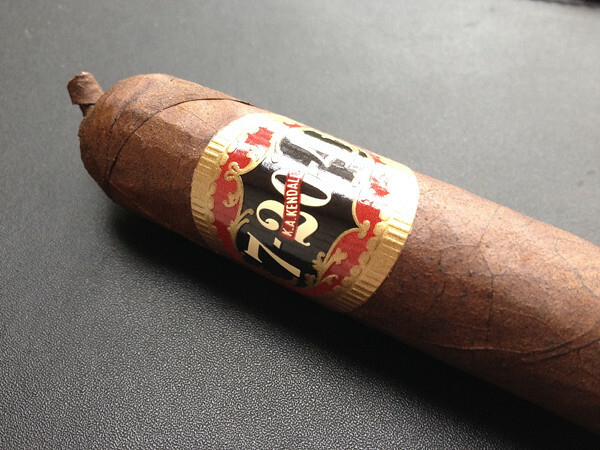 This cigar was one that I hadn’t smoked in a while but, thanks to a special from Cigar Monster, was recently acquired. I believe I paid something like $23 and change for a 5 pack just a couple of days ago. The last K.A. Kendall’s 7-20-4 that I smoked was a Dog Walker and I remembered it being a little powerhouse cigar. With that in mind, I lit up my Robusto and expected a wave of big, bold flavors to wash over me. At first I was a little let down by the medium bodied smoke and lack of punch, however, it quickly grew on me. K.A. Kendall’s 7-20-4 Robusto provided a medium bodied smoke that was mildly creamy and easy on the palate. The flavor profile was made up of coffee and woody tones with a bit of pepper and spice through the sinus. Construction was solid and the cigar didn’t require any touch-ups or re-lights. The draw was effortless and produced plenty of smoke. For a little under $5 per single (when purchased by the 5 Pack), I thought this cigar was a bargain. The medium body and full flavors made it a pleasure to smoke in the middle of the afternoon. While there were no mind-blowing or complex flavors to figure out, I found the flavors to be solid. For the money, I think this cigar is a great value and has potential to be a staple in my humidor. Smoked the dog walker once. Price was about $10 ish. Good smoke, love the look of it, but the strength got me in the final third. One I need to re visit sometime. Fantastic news Walt, to have you and Jerry back in the saddle. Hopefully a brighter and easier future for you two and I look forward to the reviews. Thanks for coming back strong. I had a Dog Walker a while back, and really liked it, but it was a bit pricey. I’m looking to pick up a lancero sometime. It’s great to see you and Jerry back to posting video reviews. They have been missed.